I am proud to tell you all that my lovely friend Ella has very kindly nominated me for a blog based award called a Liebster award. ‘Liebster’ is German for ‘favourite’ therfore bloggers nominate their favourite blogs on various websites including WordPress. 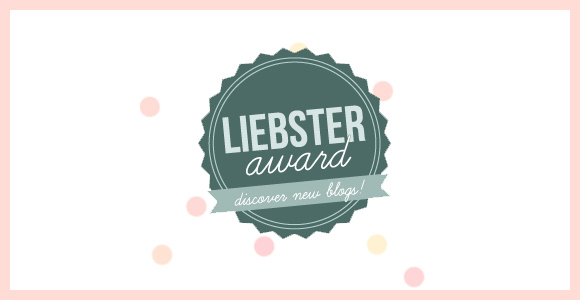 Post a copy of the badge on your blog (type “Liebster Award” into Google images; you’ll find plenty to choose from). Notify nominees and include links to the originating blog, as well as the new recipients. My favourite place to eat is Nandos – you can’t beat it! My brother knocked my front tooth out with a torch when we were little and now it breaks on just about anything from french bread to toffee apples. Ever since I purchased my first bath bomb from Lush, if I don’t bathe without one, it just isn’t a successful bath. I would love to go to New York in the Winter or Canada. I enjoyed food technology at school so maybe something to do with that. If you could invite anyone (dead or alive) on a date, who would it be? Leonardo Dicaprio in Romeo and Juliet – serious eye candy. Would you rather be successful in something you hated or fail in something you love? Definitely successful in something I hate because the thought of failing in something you enjoy is rather upsetting. I hope to be living in London doing any sort of career based on Journalism whilst writing fiction for fun! If you could have any fantasy creature as a pet, what would you choose? The little gingerbread man from Shrek, how cute would that be?! Oh you know it. I got an A in my food tech GCSE! It depends, but I usually prefer books because they’re so much more detailed but I feel more emotion from films. Favourite genre of music? I listen to a bit of everything. I went to work at World Challenge for a week and the people there are incredible, they do everythinhg they can for countries and young adults. They’re really inspiring because they have all travelled to amazing places and they are all so kindhearted. I study Journalism at College and part of our course was to set up a blog but I really enjoy uploading work that I produce outside of college too! Something you say on a day to day basis? Most terrifying situation you have been in? If you had to write a short story about anything in the world, what would it be about? Thanks again to Ella for nominating me for this! I know it’s nothing huge but it is still a good feeling when you know that people enjoy your writing!